Homeowners choose to install new fences for a number of reasons, including security, privacy, and decoration. No matter what reason you have for installing a new fence, First Class Fence & Access Control offers the wide variety of fence styles and quality professional installation you need. Call us at 1-844-485-8070 or click below to request a free on-site design consultation. We are happy to provide a free estimate for your residential fence project in Riverwoods, Glenview, Northbrook and nearby areas. Vinyl is a durable, versatile option for residential fencing. We install a vinyl fence and PVC fence that will last a lifetime with little to no maintenance, making it a great investment for your home. Vinyl fencing comes in a variety of styles, including ornamental, privacy, post and rail, and picket fencing. Wood fencing is a classic choice that provides both natural beauty and privacy. One of the major benefits of a wood fence is that it can be stained or painted to give you the exact look you want. The most common types of wood fencing are pine and cedar. We install a wide range of wood fence styles, including a split rail fence, stockade fence, and cedar fence. Ornamental metal fencing can add a decorative touch to your yard or garden while creating more security. While wrought iron fence remains a favorite among homeowners who are looking to make a bold statement, a decorative aluminum fence is a popular alternative that provides the same look without the rust and maintenance. Garden fencing serves the practical purpose of keeping deer and wildlife out to prevent them from ruining your fruits, vegetables, and flowers. A garden fence can also create a beautiful accent in your garden. Garden fencing is available in a wide variety of styles, materials, and colors, allowing you to create the perfect custom look for your garden. Installing a fence can be tricky, but you can trust the experts at First Class Fence & Access Control to solve all your residential fence needs and provide you with a fence that looks great, is built to last, and will improve the appearance and value of your property. 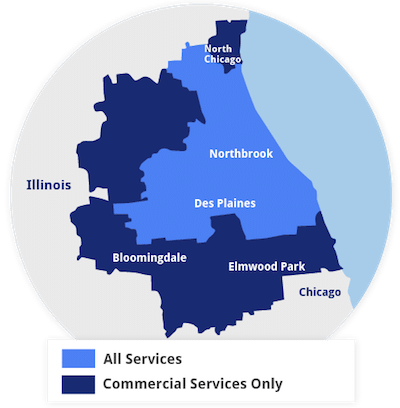 We proudly serve Highwood, Highland Park, Glencoe, Lincolnshire, Wheeling, Chicago, Deerfield and throughout the surrounding areas.